Support DocumentationStudent FAQHow do I submit work to my assessor? Simply adding content to your portfolio or assignment does not grant your instructor access to it for assessment. In order to complete this process, you must actually submit your work. In this lesson you will learn how to submit your work, and how to select the instructor to whom it should be submitted. Once you have added your work to the portfolio page, the Submit button will become enabled. 1. To submit your work for assessment, click the green Submit button. 2. 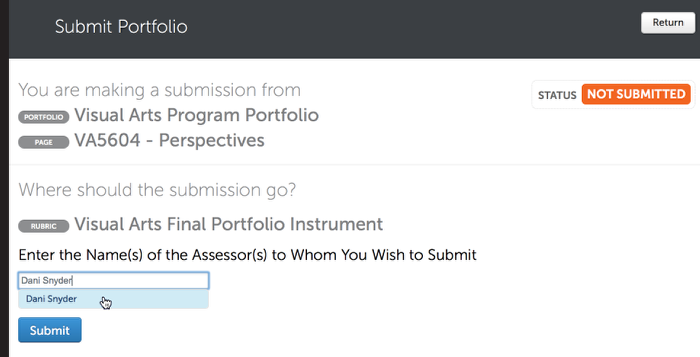 In the text box provided on the Submit Portfolio screen, type the name of the assessor to whom you wish to submit your work. As you type, any matches to what you are typing will appear. 3. When the correct name appears, click on it to select it. Don't See Your Assessor's Name? Assessors are entered into Chalk & Wire with their first and last name. Any prefixes (Mr., Mrs., Dr., etc.) will not appear in the site. Try typing your Assessor's last name only to find them for submission. What if I am submitting to an external assessor/guest? If you are submitting to an external assessor (sometimes referred to as a guest) and their name does not appear, use the "Add Guest" link above the Submit button. A pop-up window will appear with fields for you to complete. The only required information is First Name, Last Name, and Email Address, though you may add additional infromation. Once you have completed the profile, you will be able to submit to the guest that you've just added. The submission will be confirmed in green. 5. To return to your portfolio, click Return. Prev: I don't see my program/course anywhere in my account, where is it? Next: Why doesn't my assessor's name appear when I try to submit to them?